If you’re not a Kids Friendly church yet, maybe it’s time to make a commitment to form your “Kids Friendly Dream Team” and review your children’s ministry. Thank you so much for all your help and support with our Kids Friendly journey. 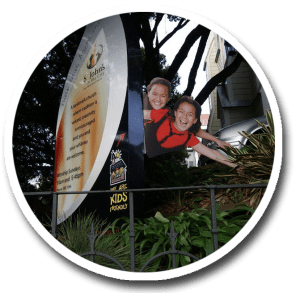 The Kids Friendly process has been instrumental in enabling St James to change focus from being a church facing amalgamation to looking forward to being an all-age worshipping community in Whanganui East in the years to come. Amazing. When we at St Aidan’s made an intentional decision to become a Kids Friendly Church, we didn’t realise the ripple effect this would have on the whole of our faith community. This has resulted in every aspect of our communal life experiencing renewal and creative energy for new mission initiatives. And we’ve discovered that becoming a Kids Friendly Church is not the final destination, rather being Kids Friendly is a way of being and living the gospel on the journey. So we need to continually self-review to ensure that we are intentionally and authentically “Kids Friendly” in our communal life and practices. Becoming Kids friendly changed the spirit of our congregation to one of openness, joy and energy. New people from the community now come and check us out and many stay – this didn’t used to happen. We can’t quite comprehend what is happening and are amazed at the way we are seeing God moving in the hearts and lives of children and families in our community. We now have at least 25 children attending each Sunday and lots more attending our community events. Our Kids Friendly Coach, Cheryl, has been been a consistent and crucial encourager of our children’s ministry. Kids Friendly is a wonderful source of resources and ideas for churches and Cheryl’s voice of experience has been a fantastic asset to our parish. We are making some exciting inroads to becoming Kids Friendly. We’re halfway through the self-review process and finding it amazing and inspiring. We’ve made a kids corner (with cushions and beanbags) up the front, and really started involving the kids in all we do. Last week they helped serve communion! An invitation to the Kids Friendly Coach to share the Kids Friendly vision with the parish council/session/congregation. A commitment by the minister, children’s ministry worker, and session/parish council to form a “Kids Friendly Dream Team”. This is a small group (usually about 8) consisting of the minister and representatives from the session/parish council, children’s ministry leaders and parents who work through the self-review document and set Kids Friendly goals. The self-review is repeated every three years or when there is a change of leadership. An assessment of your Kids Friendly review documentation by the Kids Friendly Coach. A willingness to share your resources and ideas with other churches. Download an application form for joining the network (if you are not a network member already). If you belong to another denomination or are outside of New Zealand, we invite you to join the Kids Friendly Network as an Associate Member. Click here to find out more.